$35.26 million on 3191 screens. Rated PG for mild sci-fi action. With Lilo & Stitch, Disney earned an improbable hit. For one, neither they nor any other studio had put out a cel animated flick that made more than $100 million since Tarzan raked in a formidable $171 million in the summer of 1999. Between Tarzan and Stitch, Disney put out three other traditionally animated flicks: 2000’s The Emperor’s New Groove and Fantasia 2000 plus 2001’s Atlantis: The Lost Empire. None of them exactly cleaned up at the box office, though Groove showed stronger monetary legs than many expected. With a take of $145 million, Stitch didn’t plow over the competition, but given the declining returns accorded traditionally animated flicks, that total sure looked good. It seems especially positive given the unusual nature of the film itself. With a small child as a leading lady, no real villains or heroes, and no musical numbers, Stitch differs from other Disney films. It provides a nice breath of fresh air that make it a generally winning experience. 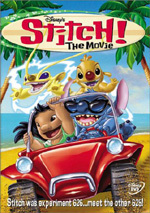 At the start of Stitch, we encounter an alien society in which Dr. Jumba Jookiba (voiced by David Ogden Stiers), the lead scientist of Galaxy Defense Industries, conducted illegal genetic experiments. These resulted in the creation of Experiment 626 (Christopher Michael Sanders), a tiny but powerful creature imbued with nothing more than the desire to destroy. The Grand Councilwoman (Zoe Caldwell) imprisons Jumba and banishes 626 to an asteroid-based prison, but while Captain Gantu (Kevin Michael Richardson) tries to fly away with the little fella, 626 escapes. The monster hijacks a spacecraft and puts it into hyperspace. This randomly sends him toward Earth, where he crashes on a small Hawaiian island. Initially the aliens want to just gas the planet, but specialist Agent Pleakley (Kevin McDonald) indicates that Earth offers a protected habitat for an “endangered species”: mosquitoes. The Councilwoman then sends Pleakley and Jumba to quietly recapture 626. In the meanwhile, we meet Lilo (Daveigh Chase), an orphaned young misfit who doesn’t connect well with the other kids. She lives with her older sister Nani (Tia Carrere), but their home doesn’t seem to work very well. Matters get worse when they receive a visit from intimidating social worker Mr. Bubbles (Ving Rhames), who warns Nani that she needs to shape up or Lilo will need to depart the home. After 626 lands on Earth, a series of trucks hits him. The little guy’s indestructible, but the impacts stun him, and he ends up in a local animal shelter. Since Lilo seems so lonely, Nani takes her to get a pet, and Lilo immediately takes to her fellow misfit. 626 tries to escape, but when he sees Jumba and Pleakley ready to ambush him, he decides to stick it out with his new guardians. Renamed “Stitch” by Lilo, the odd family try to adjust to each other, but Stitch’s violent tendencies usually cause concerns, and these ultimately make things much worse when his actions get Nani fired from her job. From there Stitch mostly follows two plot lines. We see the aliens’ attempts to recapture the escapade experiment, and we watch the ways in which Nani, Lilo and Stitch start to bond as a family. Also waiting in the wings we find David (Jason Scott Lee), a young dude with the hots for Nani. Disney offers lots of movies with non-traditional families. Heck, it’s hard to think of many that aren’t missing a father (Toy Story, Cinderella) or a mother (Beauty and the Beast, Pocahontas). The clan in Stitch seems different, however, if just because if presents a more realistic form of dysfunction. Of the movies I mentioned above, either the groups appeared very warm and loving, or they came across as excessively problematic. For example, Belle and her father were very close, and it’s tough to fathom a less loving relationship than that between Cinderella, her stepmother, and her stepsisters. Of the aforementioned flicks, only the two Toy Story movies provide characters in a modern setting, and those films don’t much concentrate on the human families. On the other hand, Stitch uses “family” as a main theme, so those dynamics become paramount. 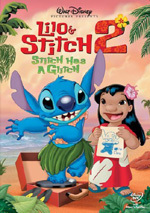 To its credit, Stitch shows that Nani and Lilo care for each other, but the flick doesn’t hesitate to present the strains that fall on both. Lilo seems remarkably flawed and human for a Disney character. We clearly see her problems and issues, and while the film makes her sympathetic, we can also discern how she’d get on the nerves of Nani and the other kids. Lilo provides something of a “warts and all” little oddball. Normally when we encounter personalities that others in the film don’t like, we totally see the side of the shunned one. They’re made out to be superior in most ways and we’re told how stupid and myopic the others are. That doesn’t really happen in Stitch. Admittedly, the little girls who disdain Lilo don’t receive positive treatment, but because Lilo comes across as so genuinely odd, we can see understand their attitudes. In addition, her interactions with Nani show how troubled a little girl Lilo is, and these make her much more dimensional than the average Disney character. Usually they have various personal concerns but present hearts of gold; they seem to possess some form of inner light, really. That doesn’t happen with Lilo, who comes across as a quirky but otherwise totally believable little girl. At times, Stitch tends to hammer us with its family theme, but overall, that doesn’t become an issue. Indeed, it adds some depth to the movie. Periodically that concept seems a little forced and hokey, but it also resonates nicely much of the time. We grow to care about this odd little clan and actually begin to believe the notions it promotes, even if they do seem somewhat heavy-handed on occasion. Lilo & Stitch doesn’t provide an exceptional piece of Disney animation, but it works well as a whole. Despite the unusual leading characters, much of the film seems pretty traditional, as it mixes action, comedy, and sentiment into a neat little package. An unassuming piece, Stitch provides a nicely charming and entertaining film. 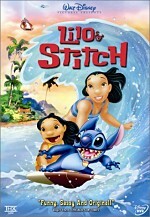 Lilo & Stitch appears in an aspect ratio of approximately 1.66:1 on this single-sided, dual-layered DVD; the image has been enhanced for 16X9 televisions. Were it not for one problem area, the transfer would have excelled. The main issue stemmed from edge enhancement. Moderately heavy haloes permeated the movie and caused distractions. They occasionally affected definition as well. Most of the movie showed good delineation, but some elements came across as a little blurry and tentative due to the haloes. Otherwise, I found a lot to like about the presentation. Jagged edges and moiré effects appeared absent. In regard to print flaws, I noticed none, as the movie looked clean and fresh from start to finish. The tropical Hawaiian setting of Stitch meant that it boasted a wonderfully vivid and varied palette, and the DVD presented those hues well. The colors consistently looked dazzling. From the lush landscapes to the vibrant fish to the bold tones of the aliens, the hues always came across as lively and tight. Black levels also seemed terrifically deep and solid, while shadow detail was appropriately dense but never seemed overly murky. Though much of the image pleased, the excessive edge enhancement left this as a “B-“ presentation. Lilo & Stitch also provided a pretty strong Dolby Digital 5.1 soundtrack. Much of the movie favored the front channels, but the mix opened up well when appropriate. It started strong in that domain due to the outer space escapades, and it also concluded with a lot of exciting sonic activity. In between, things seemed more subdued, but the soundfield matched the film nicely. Music always demonstrated positive stereo imaging, and the effects created a realistic and involving sense of atmosphere. When the action heated up, the surrounds added a fine layer of material that contributed some lively and engaging audio. For example, when 626 escaped the prison vessel through the ventilation grid, he skittered about convincing, and all the shots that featured space flight appeared solid. Audio quality seemed very positive. Dialogue always came across as natural and warm, and I detected no concerns related to edginess or intelligibility. Music appeared bright and dynamic, with concise highs and rich lows. Effects also were tight and realistic. Those elements betrayed no distortion, as they consistently appeared clean and accurate. The effects provided some strong bass response as well. From laser fire to explosions to Captain Gantu’s pounding steps, the low-end sounded deep and rich without any boominess or other issues. Because much of the movie lacked a very ambitious soundfield, I nearly gave Lilo & Stitch a “B+” for audio, but the terrific climactic sequence demonstrated enough activity to bump it up to an “A-“. Taken through the “Play All” method, these segments last a total of eight minutes and 34 seconds; additional narration shows up in the menu screen as well. These clips cover topics like volcanoes, surfing, luaus, ukuleles, leis, and other issues that connect strongly to Hawaii. They also offer a short vocabulary lesson in many native terms. Obviously oriented toward the kiddies, these pieces offer a moderately entertaining little romp through the islands. Next we get the Create Your Own Alien Experiment Game. Narrated in character by David Ogden Stiers, this combines trivia questions and guessing contests to get you to make three different alien critters. The problems seem fairly easy, and the color sequencing activity is very forgiving. “Experiment” doesn’t go much of anywhere – it offers no reward for successful completion – but it offers a painless experience. A novel extra, A Stitch in Time: Follow Stitch Through the Disney Years lasts three and a half minutes as it presents the notion of Stitch as a struggling actor. Narrated out of character by David Ogden Stiers, it shows stills from many Disney classics like Pinocchio and 101 Dalmatians. Not as much fun as the ads I’ll soon discuss, “Time” still presents a moderately cute extra. The Hula Lesson provides what its title implies. We get a three minute, 35 second presentation from Mark Keali’I Ho’omalu, hula consultant and Hawaiian music composer. We learn a little about the hula and then get led through some basic steps. Brief and insubstantial, “Lesson” does at least offer a decent little overview of the dance form. For a look at the child singers heard in Stitch, take a look at Young Voices of Hawaii. The 165-second featurette includes comments from writers and directors Chris Sanders and Dean De Blois as well as footage from the recording session. Although it doesn’t provide any real information, it offers a nice look at the talented kids behind some of the film’s music. ”Burning Love” – Behind the Scenes with Wynonna looks at that song’s recording. We watch her sing and hear from Wynonna as well as writer/director Chris Sanders during this 90-second clip. It seems very flimsy and pointless, especially since it doesn’t even bother to toss in a full performance of the tune. After this we do find a music video for “Can’t Help Falling In Love” by A-Teens. Like most other clips of this ilk, “Falling” mixes movie clips with very cutesy lip-synch images of the performers. Clocking in at a mere 60 seconds, this video seems lame. Up next we locate The Look of Lilo & Stitch, a four-minute and five-second featurette. It displays movie shots, archival drawings, and comments from producer Clark Spencer, writers/directors Sanders and De Blois, Walt Disney Feature Animation president Thomas Schumacher, art director Ric Sluiter, visual effects supervisor Joseph F. Gilland, and animators Ruben Aquino and Byron Howard. 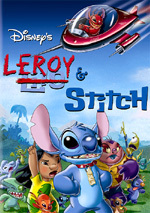 They discuss the look of Stitch, with an emphasis on Sanders’ influence and the general round appearance of the flick. This provides a quick but informative program. For a little more behind the scenes material, check out Animating the Hula, a three-minute and four-second featurette. This discusses the challenges of bringing that dance to the cartoon screen. It shows behind the scenes dance footage and animation shots, movie bits, and interviews with Sanders and De Blois and producer Spencer. It doesn’t present a wealth of information, but it mentions some of the methods used to translate the dance, and it also includes a nice split-screen comparison that lets us watch real hula alongside the animated version. The longest supplement found on Stitch, On Location with the Directors offers a 19-minute and six-second glimpse behind the scenes. A surprisingly cool program, “Location” totally avoids any form of puffiness or promotional material. Instead, it consists totally of actual material from the creation of the flick. We see footage such as discussions of story problems and character design particulars, voice recording sessions, a storyboard pitch, the painting of some backgrounds and the “photos” that run during the end credits, recording of the score and the Hawaiian children’s choir, and other details related to the art and animation. “Location” doesn’t purport to provide a real documentary, but it shows a lot of very fun and compelling snippets. The recording sessions seem especially fun, as we actually hear the directors discuss variations with the actors. “Location” gives us a totally entertaining and compelling program. Next we get three Deleted Scenes. Each of these lasts between 84 seconds and two minutes, 58 seconds for a total of six minutes, 57 seconds of footage. Presented with introductions from writers/directors De Blois and Sanders, these snippets mix finished art, pencil animation, and a few storyboards. The unused scenes are interesting to see, and some of the material might have worked in the finished film. The intros provide some basic info about the shots, and also generally tell us why they needed to be altered or dropped. Another very fun extra, the theatrical teaser trailers section includes four ads. Each one places Stitch within the milieu of a different Disney classic: Beauty and the Beast, Aladdin, The Little Mermaid, and The Lion King. All of them seem wonderfully ingenious and amusing. As the DVD starts, we encounter a mix of ads. We find trailers for an upcoming direct-to-video sequel called Stitch plus Sleeping Beauty, Atlantis II: Milo’s Return, The Jungle Book 2, 101 Dalmatians II: Patch’s London Adventure, Inspector Gadget 2, The Country Bears, Walt Disney World and the Disney Channel’s Kim Possible. In addition, you’ll see these clips in the DVD’s Sneak Peeks domain. We also get the THX Optimizer. This purports to help you set up your home theater to best present the movie on the disc in question. Apparently the Optimizer is unique for each DVD on which it’s included; unlike programs such as Video Essentials, the Optimizer should tweak your set-up differently every time. Frankly, I’ve been very happy with my already-established calibration and I’m afraid to muck with it, so I’ve never tried the Optimizer. If you lack calibration from Video Essentials or a similar program, or if you’re just more adventurous than I, the Optimizer could be a helpful addition. While not the best of Disney’s animated films, Lilo & Stitch nonetheless provides an entertaining and unusual piece of work. It doesn’t totally reinvent the Disney wheel, but it stands as something different for them, and it generally achieves its goals as it offers a compelling experience. The DVD provides erratic picture along with very good sound and a small but decent roster of extras. The latter presents a great look behind the scenes plus some intriguing deleted scenes and some of the funniest trailers I’ve witnessed. Despite the lackluster visuals and supplements, I still recommend this delightful flick.